Check the answer to 4 Pics 1 Word Christmas Challenge daily puzzle game here. 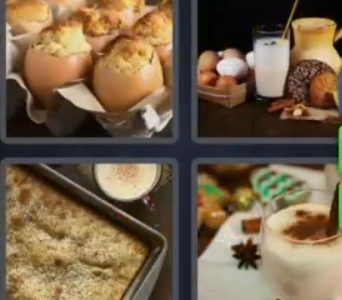 The hints of 26th December 2018 to 4 Pics 1 Word are “Eggs”, “Food items with milk”, “coffee jar”, Dish and Milk shake. Check the solved solution below in blue color. For more previous answers to 4 Pics 1 Word Daily puzzle click here. To solve the answer check all clues given in the image. By thinking based on hints you can get an idea about the solution. Even you don’t have an idea then try with next image and hit on the letter start with name of the image. Thus try until you get the solution. you can also get clue by loosing some previous points you earned. About the game 4 Pics, 1 Word game is a word puzzle game. It is a Daily puzzle game. Each level displays four pictures linked by one word. The player’s aim is to work out what the word is, from a set of letters given below the pictures. Whenever they cont solve the answer or no idea about that answer, then they can request for a clue by loosing some previously earned points. Thus players have to solve the answers. To play the daily puzzle players have to beat the 10 levels initially. Then only they are allowed to enter the daily game.